Ou tu vas quand tu dors en marchant? 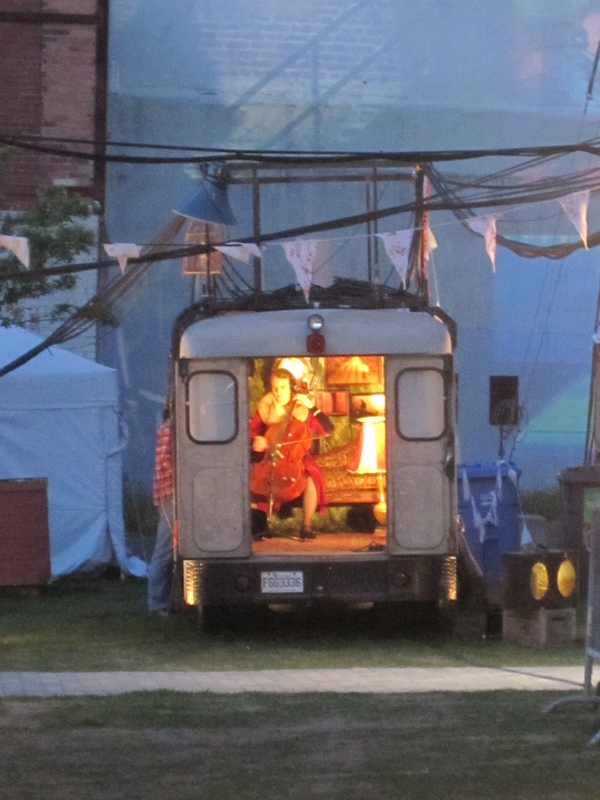 is a spectacle/multidisciplinary artistic installation produced as part of the Carrefour International Theatre Festival held each year in Quebec City. For 2015 there are five “exhibits” – four at Artillery Park and one just down the hill at Les Palais. The photos included below are from a walk-through theatrical experience created by Le Théâtre Rude Ingénierie, a “multidisciplinary creation company that focuses on the interrelation of sound, image, object, engineering and life, exploiting the potential of unexpected encounters,” in partnership with L’Orchestre d’hommes-orchestres, a collective of artists who mix visual arts, music and theater. Created at Ilot des Palais it was the most elaborate of the five pieces showcased in this year’s Festival. The piece included 14 musician environments, each its own set with detailed dressing, and the musicians in attire fitting to that particular place. The orchestra wore headsets so they could stay in sync with each other as they were spread far apart on a parking lot and facing all directions. In addition, all were also under the microscopic focus of a video camera feed that was projected on the walls of nearby buildings like a Wes Anderson version of The Brady Bunch. Listening to the sound check with each musician warming up with whatever they felt like, I had high hopes for the musical aspects of the performance. I chose not to incorporate video in this post as I’d rather you imagine your own soundtrack than listen to the unison dirge that was composed as part of the project and failed to capitalize on the musical talent of the orchestra members.